Welcome to The Abso!ute Sound online! We explore music and the reproduction of music in the home. We believe that the sound of music, unamplified, occurring in a real space is a philosophic absolute against which we may judge the performance of devices designed to reproduce music. Our goal is to provide the resources consumers need to judge how a component's sound either honors or departs from the music's truth, and to make sound purchasing decisions that maximize their experience of reproduced sound. Below is our Issue 241, March 2014 table of contents and editorial. We pick the best products in every category and at every price. Our new Editorial Assistant, Spencer Holbert, makes his TAS debut with a review of this overachieving desktop speaker and miniature USB DAC. AudioQuest has improved its massively popular DragonFly — and reduced the price by forty percent. Spencer Holbert reports. PS Audio’s NuWave combines a traditional phonostage with an analog-to-digital converter, making it the ideal device for ripping LPs. Anthony H. Cordesman brings you the details on this new breed of product. Enjoying high-resolution digital has never been easier — or more affordable. Steven Stone reports on Sony’s groundbreaking music player. A venerable 1980s amplifier has been resurrected — and improved, says Neil Gader. Rockport brings its innovative technologies and artisanal build-quality to the new Atria. 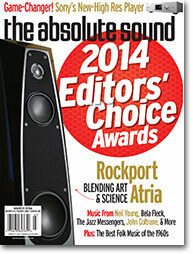 Alan Taffel auditions Rockport’s most affordable loudspeaker. In response to the recent Coen Brothers’ film, Mark Lehman selects some of the best early-60s folk music recordings. New releases from Arborea, Neil Young, Jason Isbell, North Mississippi Allstars, Patty Griffin, Tony Joe White, and Claire Lynch, along with reissues of Big Star and Nina Simone. Recitals from violinists Jennifer Koh and Hilary Hahn, a banjo concerto (!) from Bela Fleck, and the letters of Leonard Bernstein. The latest from Jane Ira Bloom, the Joachim Kühn Trio, Randy Weston and Billy Harper, and Chris Biesterfeldt; fine reissues of the Jazz Messengers and John Coltrane. Larry Gullman of MSB Technology.